The AutoCAD Converter for Excel (AcadExcel) allows to create rich tables with the flexibility of Excel and convert them into AutoCAD. 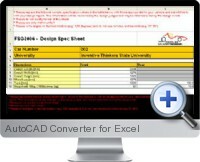 The AutoCAD Converter for Excel is an add-in for AutoCAD that is designed to process and convert rich formatting and objects within Excel table content. Imports and converts existing Excel files. Supports merged columns and rows. Control insertion point and scale. Edit the table after import from Excel. Horizontal and vertical aligning of text supported. Export selection to drawing option. Converts Excel shapes (charts, lines, text boxes, pictures, etc) to AutoCAD native geometry rasters.